Here's the scene: It's late at night, and you can't sleep. You sit on the couch all bleary-eyed and cranky, pick up the remote, and start channel surfing. You settle on something light, something that doesn't tax your intellectual or emotional capabilities too much (after all, you are tired), maybe an old John Hughes movie or a little Adult Swim. Suddenly, right when you are at your least able to deal with it, it happens. An argument based on brutal-ness? Oh mercy. 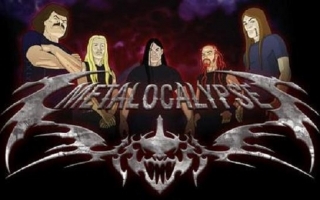 At this point in my battle with insomnia, I am typically fighting back tears, half ashamed and half angry at the unwanted emotional response that is now distracting me from Metalocalypse. I am also framing my own rhetorical debate, because I know I must convince husband that a third dog is just what we need around the house. I am completely caught up in my emotional need to save all teh aminals, and logic has taken the backseat. And that's how I know this commercial works. This is not a commercial designed to teach; it's a commercial designed to tug at your heart strings. And oh mama does it succeed. First off, we've got the song. Oh man. That song has been pulling my heartstrings since I was a disaffected and angst-ridden teenager. I can still remember the terrible tragedies of teenagerdom, against the background of Sara McLachlan's crazy pretty voice. The moment I hear that song, I am immediately transported to every bad breakup I experienced from 1994 to the day I met my husband roughly 10 years later. Suffice it to say that I'm now receptive to the content of the ad. And then there's the visuals. I really, honestly believe that if you can watch this commercial and not once feel a feeling, you don't have any. That shepherd mix struggling to walk gets me every. Damn. Time. The words on the screen are almost incidental; they basically serve as punctuation. By the time you get a load of those sad eyed doggies in cages and that poor little one-eyed kitty cat, you've pretty much gotten the message. This is pathos being used to its most perfect extension. Aristotle wasn't a huge fan of the technique, saying that, "The arousing of prejudice, pity, anger, and similar emotions has nothing to do with the essential facts," but he nonetheless devoted a large part of Book II of his Rhetoric to a detailed analysis of the different types of emotion - a kind of color wheel of human feelings. Why did he bother? Aristotle is endearing to me for a number of reasons, one of which being that he was eminently logical, so why would a guy whose entire life's work was approaching the world with a rational curiosity spend all this time figuring out how people feel and why? As an experiment, think about what a completely logical ad for animal shelters would look like. Then think about how you'd respond to it. Not so much, right? If you did respond at all, it would be with emotions - we're just too emotionally connected to animals in Western culture to be completely rational about the idea of animal abuse. 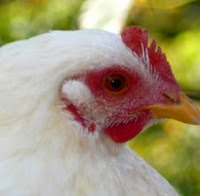 This hen does not need a flag. Aristotle believed that people should naturally make decisions in their own best interests when presented with all the data, and he may have been giving us too much credit. Logically, I need a third dog like a hen needs a flag. But in the process of writing this blog, I have watched that video maybe three times, and I am convinced that what Ming and Alfie need is a little brother or sister. Dang. Think about that for a second. Here I sit, writing a blog about rhetoric, and the pathos in this commercial is so powerful that it's working on me in spite of what I laughingly call my "academic detachment." These bad dogs do not need a sibling. I chose the McLachlan ad for a couple reasons. One, it's as good an example of an argument based on pathos as I've ever seen. Two, it's an example of pathos being used for good. Aristotle was nervous about the idea of rhetors using emotion at the expense of facts, and with good reason. Sad doggies to one side, the world of advertising (be it political, industrial, or anything else) runs rampant with arguments designed to play on our emotions. And often not to the betterment of society. Check out this handsome young man. See how bravely he gazes off into the distance? My German is a little rusty, but just looking at this young man makes you stop and say, "goodness, but Germans are attractive folk. They must have a great deal of national pride." And my non-existent skills where sprechen Sie-ing Deutsch really don't matter. 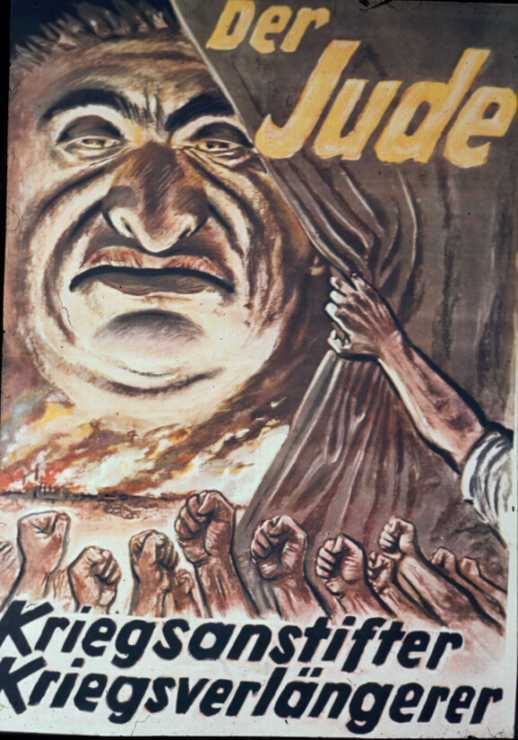 If I didn't know about the horrors of World War II (meaning if I were this poster's target audience), how could I possibly find something to object to? The words, like with the RSPCA, don't matter nearly as much as the emotional freight of the image. 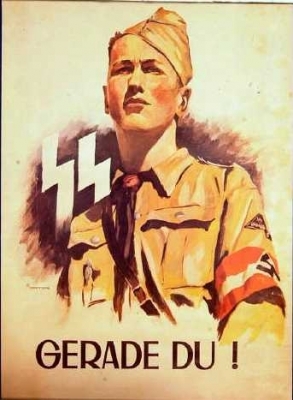 Hitler's Germany has cast itself as a nation of strong, proud, young, healthy and attractive people. Then we come to this. Um...well then. I'm not nearly so comfortable with this. Like, at all. Wow. Easy there, Germany. Let's ignore for a second that I've never seen a Jewish guy that looks anything like that. Let's also ignore the fact that, as mentioned, my German is slim to absent (although I'm pretty sure that the caption says something to the effect of the war going on longer and the cause for war being strengthened). If you're this ad's target demographic, you already know that the handsome German guy up above is wearing the white hat. So by extension...well...eek. And make no mistake. The power of the Third Reich was due in large part to the effectiveness of rhetorical arguments based in pathos just like these. Having cast themselves rhetorically as the "heroes," the only thing they needed to do was find a "villain." And when they did, they murdered millions of innocent people. Let me be clear. Sara McLachlan is not a Nazi. Like, not even a little bit. And there are really good reasons to use arguments based in pathos. If it gets abandoned, neglected, and abused dogs into safe, loving homes, I'm all for it. Easily 95% of the pathos-based arguments out there fall somewhere between the two extremes of animal lover and Hitler, more if you're not particularly political. But all of them have one thing in common: they want you to feel and not think. As an advocate of thinking myself, I have to be a little wary of that. I hate that commerical and change the channel everytime I see the damned thing. But... I use it as a teaching tool in my Composition class. VERY affective. They suddenly "get" pathos. Okay, so they can identify blatant examples. I'm not going to comment on their use of pathos in their own writing. Not so effective. And I'm loving the picture of your little hellions. What is that? 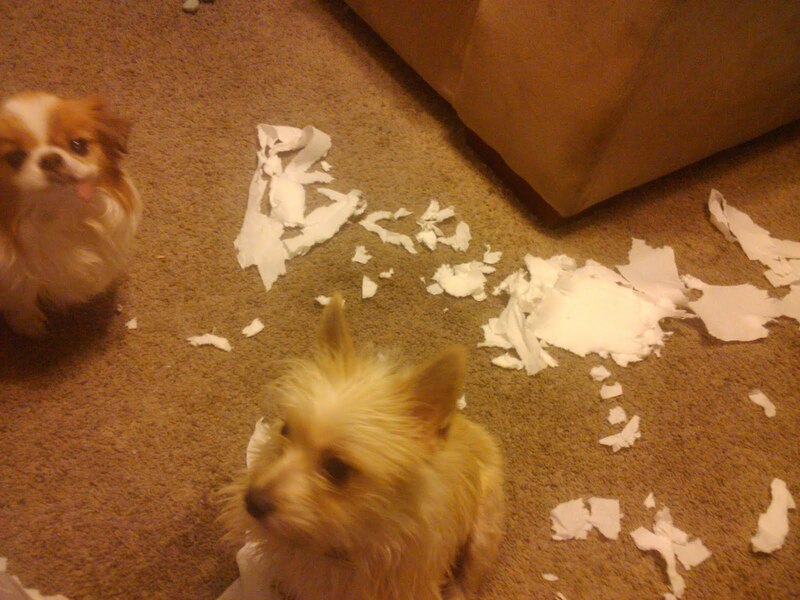 Shredded paper? I like how Alfie is like, "What? I didn't do it." He makes me smile. "This hen does not need a flag." Melly, you're right. Students' attempts to use pathos are mostly not great. But I figure they're just figuring it out - I'm more interested in whether they can recognize it when they see it from others. One of the things that always astonished me was how in a research paper, students would cite a source as fact that was really just an emotional argument, which suggests to me at least that they can't tell the difference as long as the pathos is working. Very good blog. You put into calm, rational terms an idea that can send me into raving rants. When I realize someone is appealing to me using pathos, I tend to just walk away. You can get yourself into a lot of trouble when you're all gushy and gooey, and it's trouble you'll likely live to regret. I'll bravely admit I didn't even watch two seconds of the video. I'm a bowl of jello when it comes to animals. Your two doggies are cute, by the way.